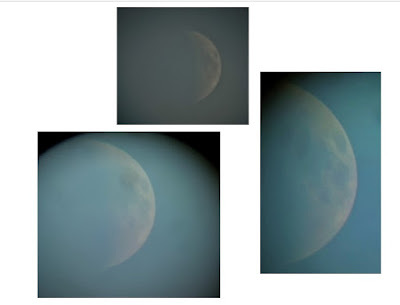 I took the photos below on November 25th using my Tudor telescope late in the afternoon whilst the sky was still in bright twilight. In Romeo and Juliet in Act 5 Scene 3 Romeo says "I'll say yon grey is not the morning's eye. Tis but the reflex of Cynthia's brow". However, it is morning and the Sun is rising so sadly he must depart. In Pericles Act 2 Scene 5 A group of knights arrive and wish to court Simonides daughter but he dissuades them saying "This by the eye of Cynthia hath she vowed and on her virgin honour will not break". Elizabeth I was known as the virgin queen and association with the Moon goddess implies she is also chaste, virtuous and pure. The eye of Cynthia is interesting and implies that the Moon goddess is watching and will see any non observance of the vow that has been sworn in her name. In Venus and Adonis Line 749 "Cynthia for shame obscures her silver shine". In Two Noble Kinsmen Act 4 Scene 1 the jailer's daughter sings "When Cynthia with her borrowed light" as she exits the stage. Finally in Edward III which is these days attributed in part to Shakespeare there is a conversation between the King and his secretary Lodowick about the Countess of Salisbury. Lodowick has written a poem about her in which he compares her to the "Queen of Shades" but King Edward is not pleased. He does not want the Countess compared to the fair and chaste "Pale Queen of the Night" but instead compares her to the Sun which "thaws the cold winter and smiles upon even the basest weed as lovingly as the fragrant rose". Unfortunately the Countess is already married and although Edward's love is unrequited he learns about the values of virtue and courage from the Countess which serve him well later on in France during his military campaign. Valiant English kings winning battles in France was always a popular theme with Tudor audiences and in some ways Edward III may be seen as a model for Shakespeare's Henry V which is as popular today as it was when it was written. Of course unlike Edward III who is unsuccessful in love, Henry V wins the hand of fair Catherine of France in a superb scene of pure romantic comedy which acts as a perfect way to close the play after the epic battles and bloodshed in the earlier acts.